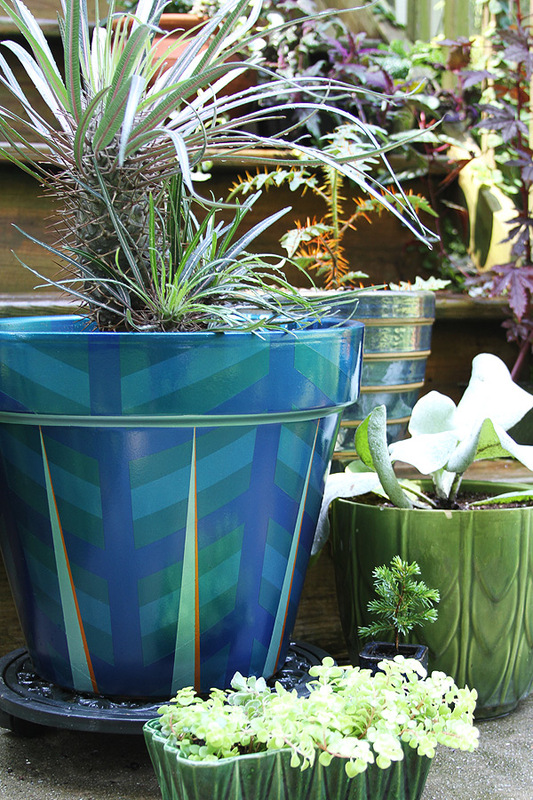 Here is sneak peek at a painting project I worked on last week… which took a week to complete! I’m very happy with it and I’ll share the rest of the project in the next couple of weeks. We picked up two vintage marble top plant stands last week in desperate need of some TLC on the legs. We bought them from the same place we bought the bar cart, magazine rack and some other odds and ends. I’m envisioning these living in the breakfast nook, in front of the curtain panels, but one may also go in the living room. I can’t decide which color direction I should go with the paint… a shade of red or maintain a gold/champagne tone. This gorgeous bar cart before & after on Design*Sponge has me thinking of revisiting it’s ‘golden’ years. I’ve been terrible about photographing and sharing new inventory. This is one of the bags I finished for last weekend and took while we were setting up the tent. It was popular but sadly, it didn’t leave with anyone so I’ll have it with me tomorrow at the Charleston Farmers Market. Turquoise glitter vinyl is my new favorite material. The Inman Park Festival was absolutely amazing as always! We had a pretty sweet spot and wonderful vendor neighbors. I had some really great response to the pieces I brought, which was a serious creative boost. I also took the opportunity to spend most of the earnings with fellow festival vendors. I’ll have to wait to post some (to share the vendor love) after they’ve been given to their new owners. 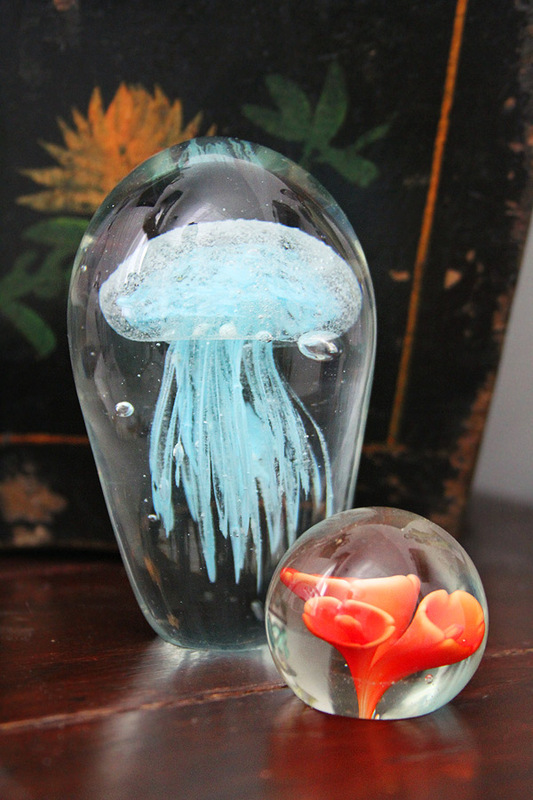 First up is something I bought for Michael, a jellyfish cast in glass by The Amazing Jellyfish. They had a variety of colors and sizes and I selected the blue because it will most likely live in the guest room. An added bonus with these is that they glow in the dark. Michael is going to build a light stand for them and I’ll post images when he’s finished. We’re also going to do another black light exposure like our vaseline bowl. 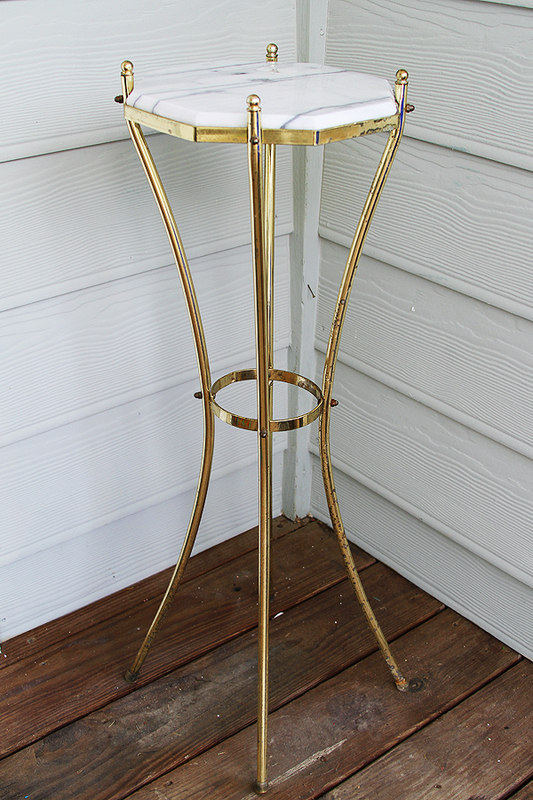 The other was purchased from a vintage/antiques dealer that sadly doesn’t have a website. I was originally attracted to the booth to ask about an antique perfume bottle and ended up walking away with the paperweight. I think they’ll be perfect together! Where does the time go when one is busy and doesn’t have much to say? Hey, it goes almost two weeks since a post. 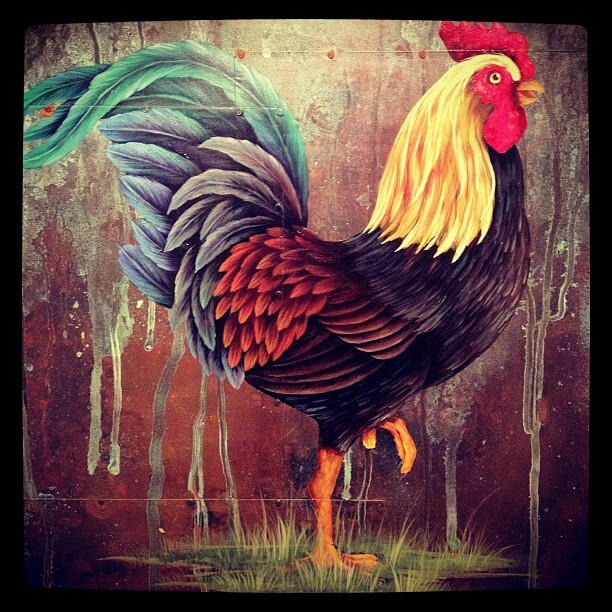 I’m heading out to Atlanta Friday morning to attend the Inman Park Festival. We (our seriously awesome friends and I) had a booth two years ago and back in 2004, and we’re coming back! It’s one of my favorite spring events and I’m so excited to ‘have an excuse’ to be there this year. I’m hoping we’re to the same spot (or at least on Edgewood) as two years ago. I love being on the parade route! Oh and, please no rain this year! Want to find out about Atlanta’s oldest planned community? Click here. 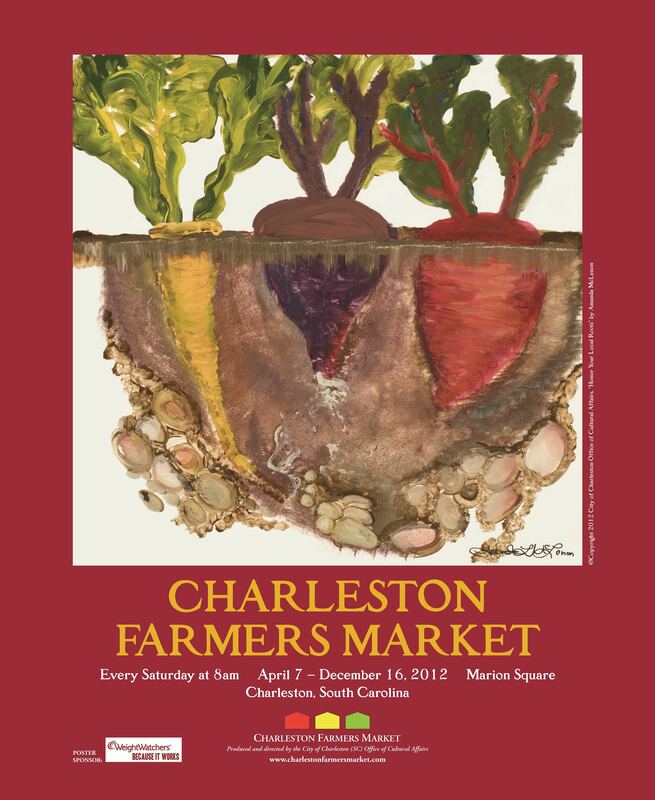 The 2012 season of the Charleston Farmers Market opened on Saturday. I don’t think we could have asked for a more beautiful day in terms of weather and turnout. We had a blast. Last year was kind of like the first day of high school, only at a school in a new district. Not only were we part of the freshman class but we didn’t know anyone. This year felt like we were returning sophomores, with the day far more relaxed and I think possibly more exciting than last year. That didn’t change that we barely got any sleep the night before and we were so fired up as we were leaving I thought I was going to spend a few hours in the garden… until we started driving home and the exhaustion hit. We totally crashed when we got home. Michael made some fabulous new stands and while we only used one on Saturday, they’re going to work perfectly for my pillows and bags. Needless to say, I am so excited and so thankful to be participating again this year! 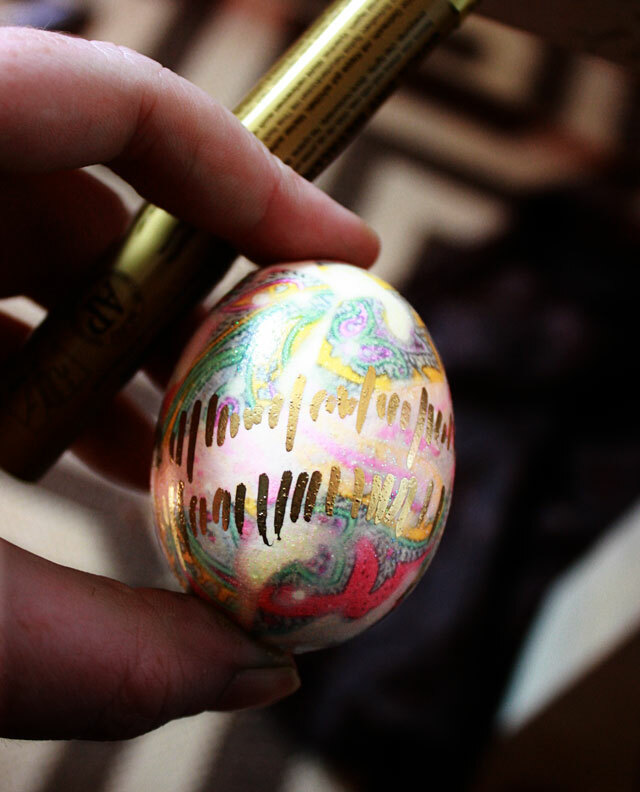 I’m always a sucker for new and interesting egg dyeing ideas/techniques and Aunt Peaches has delivered the GOLD! This is so going on my ‘need to do’ list. We’ve spent time every day this week working to reclaim the back yard. We brought the plants off the porch to give them a taste of the outside and will hopefully take the plastic down this weekend. It’s exciting to see life popping up from their winter hibernation. Several stalks of ginger are quite high at the moment as well as the canna. Last week found me scrambling about in preparation for a wicked fast trip to Atlanta. I picked up 15 yards of vinyl (thank goodness for the closet reorg) and now I’m ready to roll with some sassy new bags. I have the Lowcountry Artist Market coming up this Saturday and will have several available for sale! I’ll have some goodies to share this week, so stay tuned!